B. Bar-Yosef, Advances in Fertigation. R.P. Wise, C.R. Bronson, P.S. Schnable, and H.T. Horner, The Genetics, Pathology and Molecular Biology of T-Cytoplasm Male Sterility in Maize. R. Naidu, S. Naidu, P. Jackson, R.G. McLaren, and M.E. Sumner, Application of Capillary Electrophoresis to Anion Speciation in Soil Water Extracts. D.R. Parker and W.A. Norvell, Advances in Solution Culture Methods for Plant Mineral Nutrition Research. T.R. Sinclair and R.C. Muchow, Radiation Use Efficiency. M. Silgram and M.A. Shepherd, The Effects of Cultivation on Soil Nitrogen Mineralization. Subject Index. Volume 65 contains six reviews covering key contemporary topics on crop and soil sciences. The topics are varied and exemplary of the array of subjects dealt with by this long-running serial. 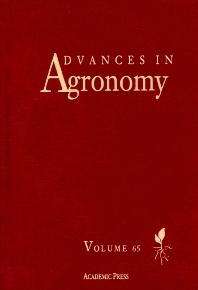 With this latest volume, Advances in Agronomy continues to be recognized as a leading reference and a first-rate source of the latest and best research in agronomy.